Where are the Sony Alpha females? 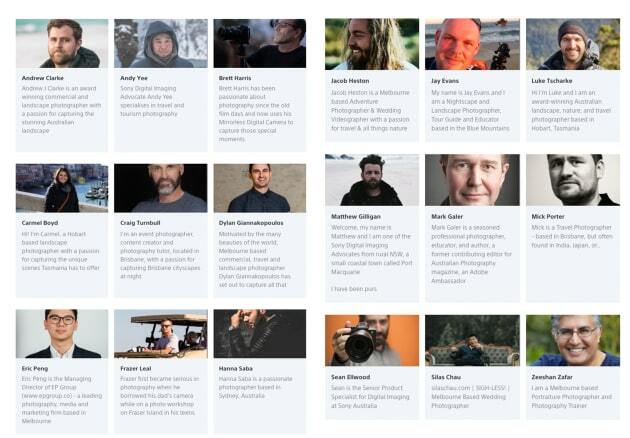 Sony Australia has revealed 16 new ‘ambassadors’ for its major new in-house marketing initiative, Sony Scene; but there’s only one female photographer in the bunch. The new Sony ambassadors. Source: Australian Photography. The 16 photographers, who are dubbed Digital Imaging Advocates, will create content and run events via the new platform to inspire other (Sony Alpha) photographers to ‘take the next steps in their own photographic journeys’. They will provide tips and post content, take enthusiasts on photo walks, run advanced workshops, and even host photography tours. In November last year Sony, now somewhat ironically, put the call out to ‘Alpha photographers’ across Australia and New Zealand. And Inside Imaging, now quite ironically, covered it with the headline ‘Sony seeking Alpha types‘. While professional photography is a gender diverse industry when compared to other lines of work, Sony told Australian Photography that there were ‘a limited number of females’ who met the criteria to enter. Limited, as in, just one – Hobart-based landscape photographer, Carmel Boyd. ‘The application for entry to become a Sony Digital Imaging Advocate was spread far and wide, inviting all Sony camera users who share a passion for photography as well as experience in sharing this passion with their community via workshops etc. Some new Alpha ambassadors include Mark Galer, Mick Porter, Luke Tscharke, Jacob Heston, Eric Peng, Frazer Leal, Andrew Clarke, Andy Yee, and Brett Harris. Workplace gender diversity is a red hot topic, and it’s surprising this glaring omission wasn’t flagged and addressed by Sony’s marketing department. In 2017 Nikon was accused of ‘not valuing women in photography’ when it assigned 32 men, and not a single woman, to promote the D850 in Asia, Africa, and the Middle East. At the time Inside Imaging‘s predecessor, ProCounter, noted that most camera manufacturers favour men over women to serve as ambassadors to market products. ‘Sony Australia’s Digital Imaging Ambassadors is made up of five male photographers,’ we wrote at the time. ‘The Canon Australia Master program has more diversity. It’s roughly 20 percent female, including Kelly Brown, Jackie Ranken, and Krystle Wright among the 14 Master photographers, as of 2016. However, more AIPP members are now female, with the Institute reporting the family portrait photography market has more women entering the field than men.